Powers/Abilities: SuperPatriot's pre-cyborg body had the stamina, endurance, strength, and agility of ten peak human athletic men as well as a slowed aging process. SuperPatriot's artifical eyes give him, beyond conventional sight, night vision, microscopic vision and telescopic vision. SuperPatriot's arms and legs have been replaced with nanite-powered cybernetic limbs, which can virtually obey his every mental command on a molecular level. When put to their most common use, his arms can assume the shape and function of any weapon he can think of, so long as they retain a constant mass. The ammunition for these weapons is, in most cases, stored elsewhere in his body but he can use actual compontnets of his self-regenerating nanite-powered body. He can re-load with conventional ammo and prefers it as using other means means reduces his mass. SuperPatriot's hman form has an accelerated healing ability and as a cyborg he is capable of lifting (pressing) approximately 10 tons. At one time during the '40s, SuperPatriot took a drug that allowed him to fly for a limited range, he discontinued the use of this drug due to their dangersous hallucinogenic side-effects. 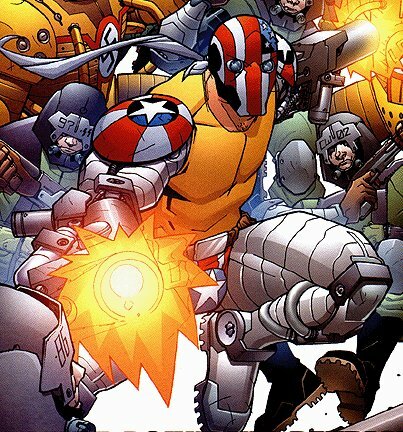 As the cyborg SuperPatriot, he once has added temporary additional nanites to his body, via a special cannister, which added extra mass to his arms, allowing himself to create larger weapons and more powerful firepower. The additional nanites had a time limit, however, and they wore off after a short time. History: John Armstrong was a P.O.W. during World War II, and nothing but trouble for his captors. The Nazi's used him as a test subject in an "Uber Mach" (presumably not wanting to kill their own soldiers testing it). Luckily for John, the experiment was a success, and he gained superhuman strength. His captors, having neglected to think through what they were doing, suddenly discovered they had replaced troublesome POW Armstrong with incredibly troublesome superhuman Armstrong. He promptly led his fellow prisoners in a riot and escape attempt. In the early 1990's the SuperPatriot was caught in a battle with Mako, a supervillain in the employ of the Vicious Circle, a Chicago based criminal organisation. Terribly injured, he lost all of his limbs, only to have them replaced with cybernetic ones. For a while this new version of the old hero was under the control of others, but eventually he regained his life and his freedom.